CIKA has supporters from many different walks of life: work and business, and the following story shows how a conversation between CIKA committee member Ruth and her local postie evolved into a show of strength and support for our fundraising. 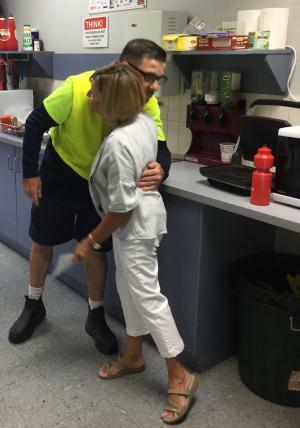 Ruth lives in Bendigo and a conversation about CIKA with her local postie Chris Hunter drew an invitation to speak to the Bendigo posties about CIKA and the research we fund. 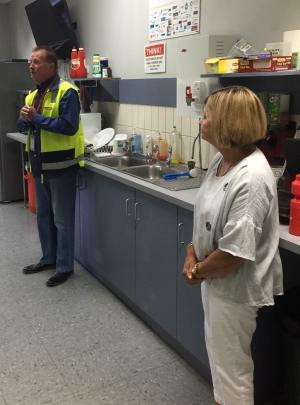 An offer was made in 2017 for CIKA to benefit from a monthly raffle when the posties get together and this initiative was fully supported and encouraged by Bill McGavock, the manager of Bendigo Delivery Network with Australia Post. So each month in the early morning, raffles are held using donated products which have included meat, hampers and even a child’s bike, with all of the proceeds going to CIKA. In the depths of winter a beanie sale takes place at the posties’ work place and this is undertaken with a sense of fun! The result from 2017 was $1,000 and we were overwhelmed to receive a cheque for $2,000, which is a stunning result from all the fundraising from 2018. 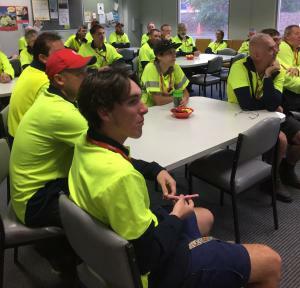 Thank you to all the Bendigo posties for their enthusiasm and commitment to supporting CIKA and we welcome them on board for another year of fundraising for us in 2019. Bill McGavock, Bendigo Delivery Network manager, addresses the monthly meeting, watched by Ruth. Ruth and her postie Chris.